This wasn’t going to be another assignment, I thought. Over the past few months we were so busy with two of my son’s weddings, Andrew and Sara married in May in New York (video) and Evan and Leona married in November in Montego Bay, Jamaica (video). At both weddings I was responsible for photography, videos and so much more. In August we were on assignment in Punta Cana, DM reviewing the Iberostar and Dreams resorts, so now, I needed to simply relax and vege out. I didn’t want any pressure on a vacation, love to cruise and after this year of weddings and a poor economy, our budget was a bit tight. When Gladys called me and told me she could get us on a 5 night cruise on the Navigator of the Seas for $400 each and could also get cheap air on Spirit Airlines out of Atlantic City, NJ at $150 each round trip, I jumped at the chance to go. My son Evan and my beautiful daughter-in-law Leona live in Florida. Our plan was to fly down to West Palm Beach, drop off our little Chihuahua Georgie with them, stay one night in West Palm, and board the ship the next day. Evan and Leona have two wonderful doggies too, Rocko a spunky male Shitzu and their beautiful Sunny a gentle, loving female Rottweiler mix. Georgie loves being with them and they love him, so we felt good leaving him there. Each time we go on an IPA assignment, we have to find a place for Georgie, pack a ton of photographic gear, clothing and prepare myself for what usually becomes a tiring few days of shooting everything I see. Then I usually spend a week processing all the digital files to create a video/slide show and write the reviews. I didn’t think I would end up doing such an extensive one for this trip, but as you can see I just can’t help myself. Cruises are different then most trips. 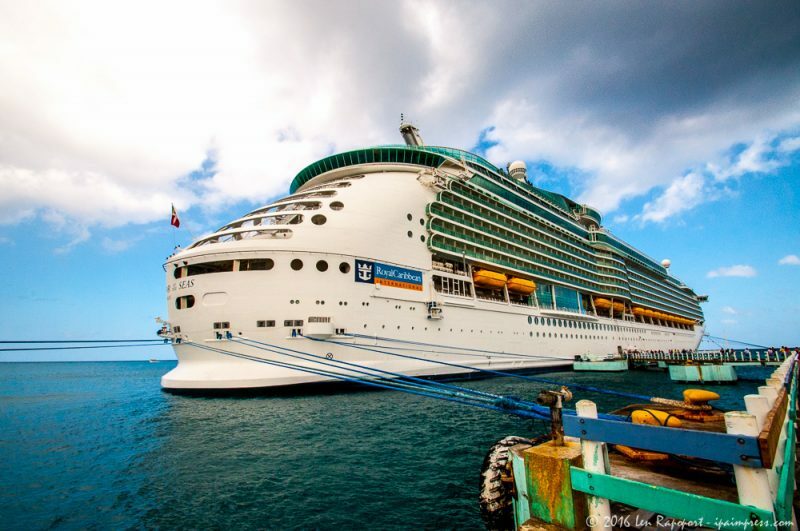 Once you board the ship and unpack, you never leave your hotel. No need to get into a rental car, no need to make restaurant or show reservations and no need to do much of anything other then to relax, enjoy yourself and forget about your waistline. There is nothing more convenient then a cruise and the prices this past year were, well, unbelievably low. Leaving the bitter cold of January in New Jersey and spending some days in Florida with family and friends and enjoying a cruise, was well earned and a no brainer. I have been cruising for over thirty years and remember the old days when they offered a 2-3 night cruise to nowhere. The ships, in those days, were nothing short of horrible compared to today’s huge luxury liners. The shows and facilities on those ships brought back memories of the many summers we spent in the Borscht Belt in the Catskill Mountains of New York. If you saw the movie Dirty Dancing (who hasn’t) , then you know about the Catskills, where many entertainers got their start in show business. Today the RCL ships are simply magnificent, nicer then most hotels I have visited and the choice of food and entertainment rivals some of the best resorts we have visited. In 2006 I wrote a review on the Freedom of the Seas, then one of the largest cruise ships in the world and in 2007 one on Celebrity’s Century of the Seas, also owned by RCL. RCL, IPA and my wife’s travel agency have had a nice relationship over the years. You may want to read some of the RCL press releases on our site. I decided to call Lyan Sierra Caro an RCL senior account executive based in Miami to let her know of our plans. I asked Lyan if she could contact the ship and request a meeting for us with the ships Hotel Director, the Captain and, if possible, arrange a tour of the galley, she pulled through for us and we were all set to go. The ship was completed in 2002 and is still considered one of the larger ships in the world. The Navigator carries 3,114 passengers, plus 1213 crew. Her length is 1,020 feet, with a beam of 157.5 feet and is 138,279 gross tons with 15 decks. Note: Oasis of the Seas is 225, 282 Gross Tons. Once we boarded the ship the excitement began. We unpacked, walked out on the balcony and I took out my camera and began to shoot the beautiful Port of Miami sunset, which you will see in the video. One of the great things about these newer ships is the relatively low cost of a balcony stateroom. Unlike the older ships, you can see from the photo above, outside staterooms all have glass balcony’s and there are lots of them. The less costly inside rooms are great for families that want to take their children or those on an even smaller budget then we had. The kids get the inside rooms opposite mom and dad’s balcony room and can visit mom and dad whenever they want. On these larger ships they even have rooms that have windows facing the Royal Promenade, where guests can see the shops, people, restaurants, pubs and parades. It is like having a room overlooking a bustling city street, not bad for an inside stateroom. We were pleased to find a nice change to the annoying muster drills that are mandatory on all ships. There was no need to put on the oversized, orange, life jackets and run up and down stairs to your muster station, tripping on and getting pushed by others. We weren’t told why the rules changed, but I can only think that it might have been because so many guests had accidents going up and down the stairs wearing these bulky jackets. Now if you have cruised before, you know what all passengers do after these drills, they hit the buffet, and enjoy their first meal on the ship. The Windjammer buffet is set up at the rear (stern) of the ship and extends further aft. It also includes “Jade”, an Asian fusion buffet so if you like Sushi, you will love Jade. I am a hamburger guy and although they had Johnny Rockets on board ($5 per person additional to dine there), I found some great hamburgers and the trimmings at the Windjammer. My wife is a more sensible eater and found healthy choices too. 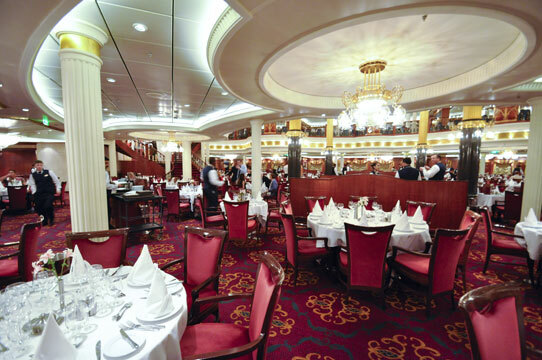 There are so many dining choices on board and two specialty restaurants, Chops for what else steaks and chops and Portofino for what I would consider Mediterranean fare. We immediately made our reservations for one night at Chops. At a cost of $25 per person, I can tell you it is money well spent. The huge filet mignon I ordered, the four sides, the huge shrimp cocktail, salad and dessert was well, the best deal ever. Take a look at the video and the menu and food and I am sure, when you cruise on the Navigator, you will want to dine in one of their excellent restaurants. Because this is meant to be a relaxing trip and assignment, I wanted to meet the Hotel Director, find out more about the ship and then visit the bridge where I would meet the captain and finally visit the galley where the thousands of meals are prepared each day. We were pleased to arrange a meeting with Jean Claude Salvadero their Director. 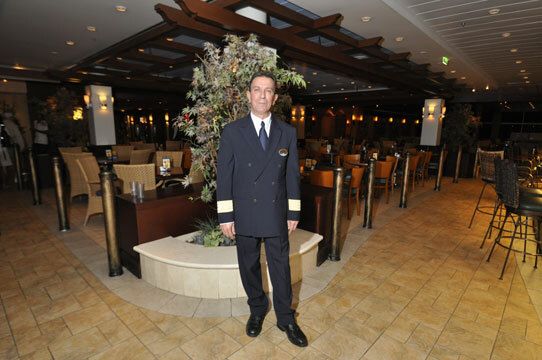 Many people may not realize that cruise ships have hotel directors. 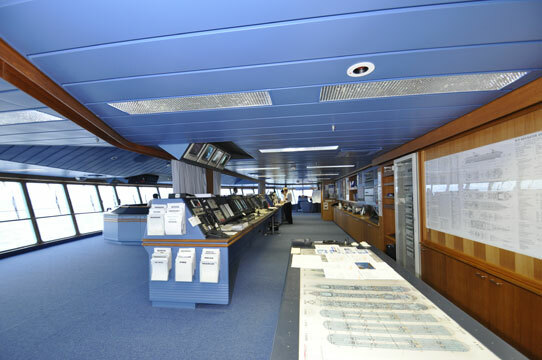 Their job is a critical one, that if done properly, insures the safety and comfort to the ships passengers and crew. The captain also known as the ships master, is responsible for the entire ship and all the ship’s directors report to the captain. Captain Leif Otto Bang boasts a 50 year career at sea and was part of the team that supervised the building of this ship. 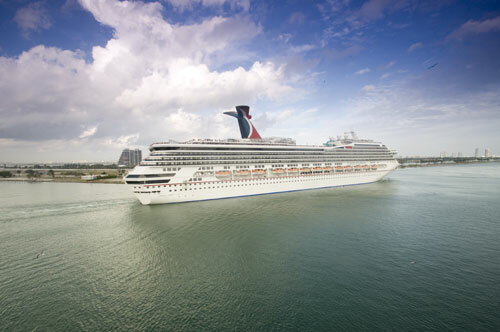 Other team members include the food and beverage director, the cruise director who is also known as the entertainment director, the chief engineer and the loyalty ambassador who helps passengers plan future cruise vacations. For those that have the means and the desire to enjoy a truly opulent experience, the Navigator of the Seas boast magnificent suites. Many families find booking a suite is actually a great way to vacation and keep the whole family together. If you love to lay out at a pool and take a dip in a pool or hot tub, you can do it on the Navigator. Plenty of chairs, 3 saltwater pools, Ancient Greco-Roman theme Solarium and loads of activities and entertainment at poolside. I tend to identify with the belly flop or the men’s hairy leg contest. My wife prefers to learn some new dance or fancy steps and then hit the spa for a workout and a spa treatment. 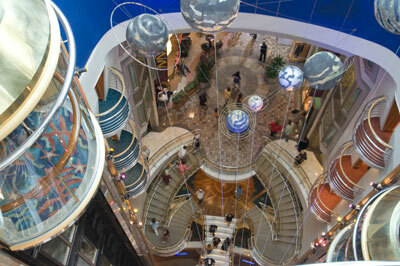 For others, that really like the physical challenges, the ship offers rock climbing, dodge ball, basketball, jogging, inline skating, power walking, miniature golf, ice skating, yoga and pilate’s or you can get a good workout at the health club. If you can’t get into any of these physical activities, then you may prefer the many seminars, workshops, getting online at the internet lounge, playing Bingo, board games, Lotto, a movie in their movie theater, or maybe do some serious shopping. Of course you can also attend art auctions or enjoy some games of chance in their comfortable casino. Now we haven’t even covered all the activities and excursions available in the ports of call, needless to say their were many. Since I have been to almost every island in the Caribbean and have been warned over the years by my family not to bring any native trinkets or tee shirts home, the ports of call on these short cruises doesn’t really excite me much, but on this cruise it was different. Our first port of call, day 3, was Labadee, Haiti. 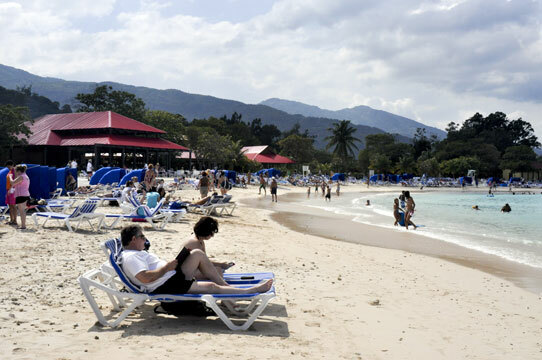 Labadee is port located on the northern coast of Haiti and is a pristine beach reserved exclusively for RCL guests. Be sure to bring your water shoes, there are rocks and coral in the water so getting in and out of the water was a bit of a challenge, but it was worth it, the water is crystal clear and just the right temperature.. The ship arranges for a wonderful beach barbecue and employs 250 Haitians to help make your day a memorable one. By bringing passengers to Labadee, RCL helps the local Haitian population at this very critical time. They provide not only financial support, but also help to normalize the lives of those that service the ship and its guests, as well as, those that sell their wares to the passengers. Before going on the cruise, I had heard people question RCL’s motives and their continued visits to Haiti after the devastating earthquake there. I can assure you their motives are pure. Every time an RCL ship docks in Labadee, they deliver much needed supplies to the island. On our ship alone you can see over 140 pallets of medical, food and other supplies being off loaded onto the dock. In addition to bringing these needed supplies, at the time of this report, RCL has donated and collected over two million dollars to aid the people of Haiti. This is a company with a huge heart and one I personally believe in. I suppose, in light of transparency, I should also disclose that I am a proud RCL stock owner as well. I really can’t say much about Ocho Rios because we didn’t book any excursions, didn’t need to shop for anything and didn’t like turning down the 20 plus cab drivers that descended on us as we got off the ship. We spent an hour or so window shopping and returned to the ship to meet Captain Bang and get a tour of the bridge. Remember, we had recently spent time in Montego Bay, Jamaica at my son’s wedding there. You can read my review and watch the amazing video taken at the Iberostar Rose Hall Grand Resort. Today it is rare to visit the bridge on a ship…security is extremely tight and also impossible to get a tour of the galley, health issues you know…so for me, it was indeed a privilege to be able to once again go to the bridge, watch the captain and his fellow officers pull the ship out of the port at Ocho Rios and head for the open sea. It still amazes me that these ships no longer need tug boats to safely pull them out of a port, they have engines on the side of the ships so they can move out sideways. Captain Bang was generous with his time and we didn’t want to keep him too long, so we took some photos and left to visit the galley. We met with Junior Downer who is the CDC Executive Sous Chef. Since the larger kitchen was just cleaning up after lunch and would be dangerous to tour, he took us on a tour of their bakery and prep areas. I never realized that all the wonderful breads, rolls and pastry are all baked on board the ship. I happen to be a simple man and almost ashamed to admit I love good, crusty rolls and bread, OK, I admit it, I love my carbs. Each evening at dinner, I would tell our assistant waiter to just keep my bread plate full. Loved their baked goods, yum. 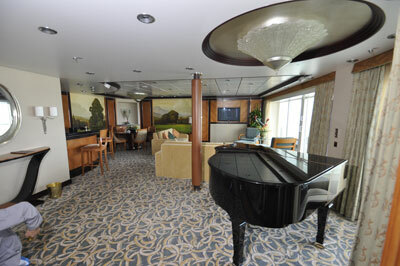 “I marvel at the fabulous decor and construction on ships like the Navigator. Since a picture or in this case a video is worth 1,000 words, I will ask you to view my video to see some of the wonderful shows we were treated to each night. I love a good comedian and we enjoyed watching three of them. The dancers and singers were also top notch and the production shows were as good or better then many Broadway shows I have seen. With all the interest today in dancing and talent competitions, I would watch the shows and wonder how many of these talented performers were discovered on some of these shows. Good stuff and a great way to end the evening, unless you are young and like to dance, gamble or eat a bit more before you turn in. Since we had the late dinner seating we went to the later shows and frankly, I couldn’t eat again after the shows. I didn’t have a desire to go to one of the many lounges on board the ship that continued to rock until the wee hours of the morning. Yet many sat in the piano bar, wine lounges, watched karaoke, went to late night lounge shows, visited the disco club, attended parties at the poolside deck or went to the casino. After a long day and three or four meals, I just wanted to get into bed, turn on the TV, view one of the movies they offered and go to sleep. I knew that if for some strange reason, I did get hungry again, I could always call room service for a late night snack. “Did I mention The wonderful Photo Ops? From our balcony, we watched two Carnival Cruise Line ships leaving before us. I have traveled all over the world, from Asia to Africa and I can truly say, for me, cruising is on top of my list of vacations I love to take. You pay for your vacation in advance and plan your excursions if you want to take any and the only thing you do on board the ship is enjoy yourself. It is an all inclusive vacation, which resorts now offer and the only costs are alcoholic drinks or sodas and bottled water. I don’t drink alcoholic drinks, live on iced tea at home and when I am away and don’t really gamble. I don’t buy much when I travel, at my age it is all about downsizing the stuff I already own so this becomes one of the least expensive, deluxe vacations, anywhere. After all, where can you go, stay at a 5 star hotel, eat as much as your belly can hold, go to shows each night, bask in the warn sun each day and meet so many wonderful people and do it for about $80 per day per person? When I go out to a local chain restaurant we spend $50-$70 for dinner, breakfast is another $25 and lunch can run $30. Do the math, cruising is less costly then staying home and eating out. I suppose that is why we see so many seniors cruising. Seniors are smart (we have to be) and we love a bargain. 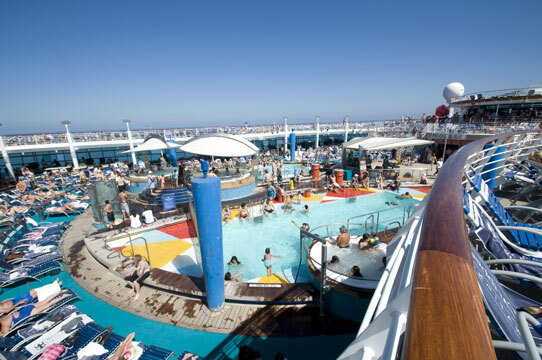 Many have the free time to take advantage of all the great RCL cruises being offered and seniors know just when the cruises offer the best value and since many don’t have to worry about taking off from work, we can go when the deals are at their best. Cruising is usually at its lowest in November through February, people don’t cruise before and after the holidays or the weather might not be a bit iffy, but for many, it is not only about sitting in the sun, but rather enjoying the cruising experience. So if you want to take a cruise, check with your travel agent, RCL or contact us to plan your next RCL cruise. Young or old, if you haven’t cruised on one of the fabulous RCL ships, book your next cruise on the beautiful Navigator of the Seas and please let them know you saw our review and our video. I would like to thank all the wonderful people we met on our cruise and of course Jean Claude, Captain Bang and the entire staff and crew on the Navigator of the Seas. Check out their special pricing still in effect and remember, these low prices won’t be around too long, so book a cruise now, you will love it. Visit or call Gladys Rapoport at Travel Pavilion she is an RCL and cruise specialist.